At what point do automakers confront the fact that they are in the software business? The trend has been building for decades, little by little, as software has contributed more and more to consumer functionality, the user experience, and the dynamics of the vehicle—from dashboard instruments to the connected vehicle, powertrain, safety systems, and in-vehicle infotainment. 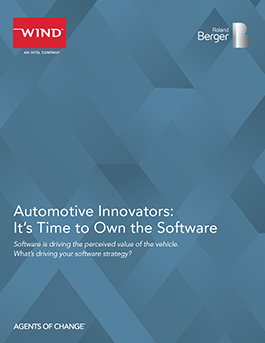 This paper explores the need for automakers to adopt more complete software ownership strategies, and the specific capabilities of Roland Berger and Wind River® for delivering on these demands.